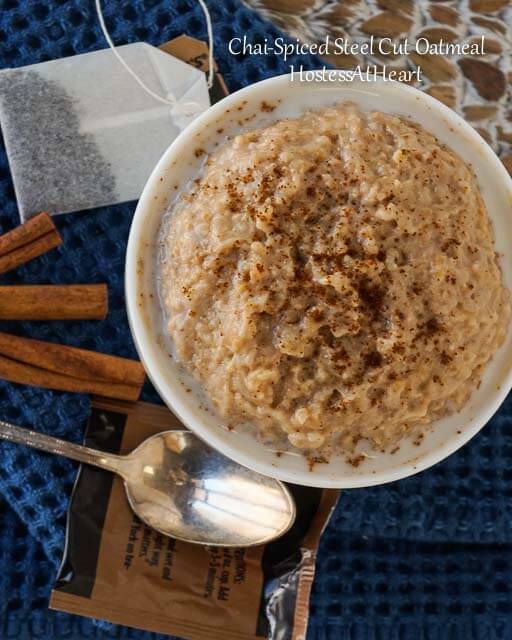 Chai-Spiced Steel Cut Oatmeal makes a warm and filling breakfast that is a healthy and flavorful way to start your day. If you follow my blog very closely, you may think that this entire blog is on oatmeal. Maybe you are just thinking that I seriously need an intervention. 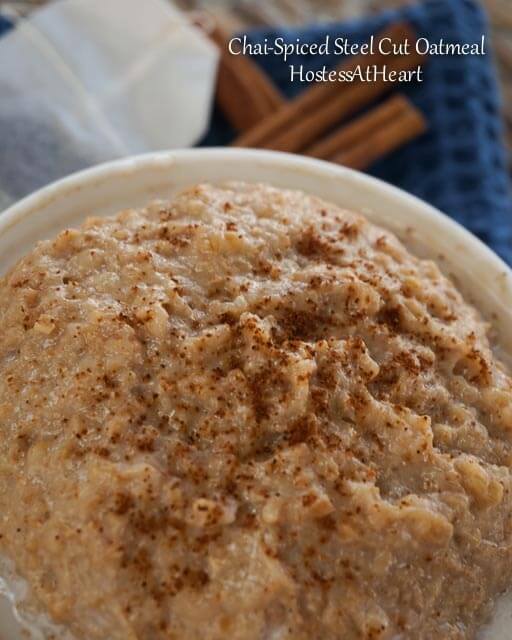 Bear with me, I have one more for you…Chai-Spiced Steel Cut Oatmeal. I do love the stuff, but another reason that I am such a fan of oatmeal is because it is probably the single best way for me to watch my weight. How can a food that fills you up still allow you to lose or maintain weight? In my case, it fills me up and keeps me satisfied. If I start my day with a serving size of cold cereal, in many cases that is 2/3 to 3/4 of a cup, I am hungry within 2 hours and looking for a snack. Who wouldn’t be? Also, there isn’t any added sugar hiding in oatmeal. Not hidden meaning you control the way you eat it. I’ve recently seen recipes that are flavored with tea bags. What an amazing idea! Flavor without calories. One of my favorite tea is Chai. Especially during the colder months. The spices are warm and just like a big ole hug in my book. Oatmeal is kind of like that for me too. The combination of the two is a pretty big hug! I recently came across a similar recipe in the “Cuisine at home” magazine. This recipe uses banana. I like a fresh banana or banana bread, but don’t put it in my oatmeal or my smoothie. People say your can’t taste it. Phooey, I can too. I used unsweetened applesauce instead and adjusted the spices a little more to my liking. One more benefit of this recipe is that it is cooked in the crockpot. Can you imagine waking up in the morning to the smell of warm spices? It makes you want to put on those bunny slippers and head for the breakfast table! I stored the remaining oatmeal in the pyrex measuring cup used in the recipe, and just covered it with plastic wrap. Each morning I just spoon a serving into a bowl, added a bit of almond milk, and warmed it in the microwave. Combine all of the ingredients except the vanilla into a 4 cup pyrex measuring cup. Press tea bag into liquid. Place measuring cup inside a 6 to 8-quart slow cooker. Add water to the slow cooker to come halfway up the side of the measuring cup. Cover slow cooker and cook oats on low setting, 7 to 8 hours. Discard tea bag and stir in vanilla. Refrigerate unused servings in a covered container. Lol! Julie when I opened up this post in my email, the first thought that came to me was, “wow, Julie really does like oatmeal”! This combination of ingredients sounds really delicious–cozy and warming. I have not yet joined the oats-in-a-crockpot team, but this technique is intriguing. Sounds like you cook it in a water bath! This is totally unexpected and I’m glad I read that through because I would have put it right into the slow cooker and cooked it to a crisp! Glad to see you survived the wedding! Congratulations! This recipe comes out very dense, but I mixed a bit of almond milk with it and was good to go. I don’t use my crock pot much but it came in handy for this recipe. There is something so soothing about the gentle sweetness of oats. This bowl must be such a heatwarming treat – lovely! Is is so nicely sweetened and delicious. Thank you for stopping by! Lovely lovely lovely!!! And a whole blog about oats sounds good to me!!! Mmmm, I can almost smell that! An intervention–you are hilarious. Delicious and hearty breakfast for a cold winter day. Looks great, Julie! Thanks Nancy! I think it’s one of my new favorites! The idea intrigued me too. It came out even better than I thought it might. Love the teabag idea! Does it add a lot to the taste? Thanks for sharing. Believe it or not it does! I think I will be experimenting with this technique a bit more. thank you for visiting! Thank you so much Mel! I was very surprised how much flavor you get from that one teabag. Thank you Ana! What a great tribute! I love the stuff and it’s so good for you. I have to say that this recipe is easy and delicious! I’m glad I haven’t oatmealed you out! You must be working on your website? I couldn’t get in. Still can’t get in. I’ll try again in a little while. I eat oatmeal almost every day, but never tried this version! It was new to me too Aaron and I eat it about every day too. I must say that this is a new favorite. Thank you so much for visiting!